Beamblog by Beamdog - Great games, enhanced! The 2.5 Update Beta Is Here! Beamdog Announces Axis & Allies Online! A fair wind favors the Sword Coast today as the 2.5 update arrives in Baldur’s Gate! After weeks of waiting on becalmed seas, our swashbuckling team of developers have released a patch filled with features and fixes. 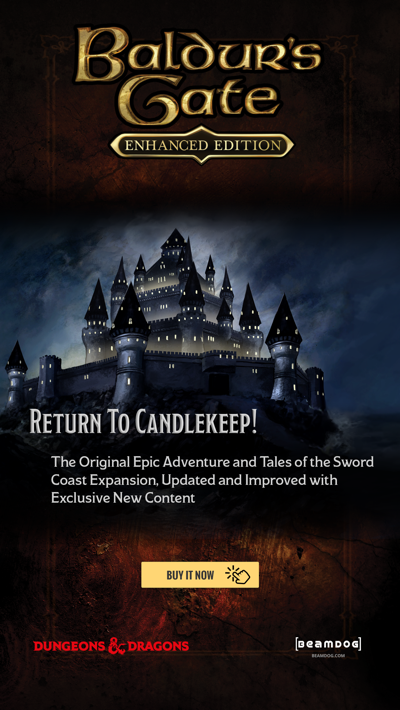 Beyond the city gates, adventurers will find enhancements to the Baldur’s Gate: Enhanced Edition expansion, Siege of Dragonspear! Read on for the full details. It should be possible to accept Thalantyr's quest to help Melicamp if you initially decline. Jaheira should recognize Seniyad during the encounter with Aldeth. Tazok should have a appropriate response if Kivan is in your party. [AR0108] Killing Sarevok In Ducal Palace Soft Locks the Game (No Progression). [AR0502] Tourists should not live through Demon Knight's Attacks on Bhaal Mode. [Character Creation] Import does not include a Shaman Pregen Character like BG:SoD Does. [Journal] "Joseph's Wife" quest should not disappear after completing. [Journal] An Offer from Taerom Quest should have quest text. [Journal] Completing "Kylee's Dagger" Quest should add all Popup entries to journal. [Journal] Important events should never be marked as "finished"
[Journal] Journal Entries should not "disappear" from journal upon completion and then appear after save/reload. [Journal] Quest "Poe's Tale of Firewine" should close if conditions are met. [Journal] Re-work "Troubles in the Region" Quest in BG:EE to be Journal Entries instead of Quest. [Journal] Tazok and The Bandits Header should not be "Tandem in Extremis"
[Load Saved Game] Halen's Portrait should not be out of place in the "Prologue Start" saved game. A commoner in Baldur's Gate should not talk as if in Beregost. Avenger druid baby wyvern should be able to poison with its attack. Baeloth should behave correctly at 19+ reputation. Baeloth should not repeat the same dialogue twice. Bartender in the Helm and Cloak should open his store for low rep/chr players. Certain scrolls should be named "Letter"
Commoner near Rasaad should not have nothing to say to you when talked to. Dorn's journal should not mention "going to Nashkel mines" if you have already been. Edwin should not speak to you about payment If Dynaheir dies for any reason. Edwin should target both Minsc and Dynaheir when they come to blows. Greenstone Amulet removes Kiel's helmet's protection for morale failure. Mayor of Nashkel should recognize that you have cleared the mines. Minsc and Edwin should not give the quest to save Dynaheir if you have already saved her. Minsc should leave with Dynaheir after fighting Dorn. Multi-class characters should not use the bio of their first-listed class. Osmadi should not create himself if you speak to him while he is charmed. Players should be selected and can move after exiting "group combat tutorial"
Prism's emeralds should be placed in each eye in the statue he created. Rasaad should mention Sorrem's location even if Viconia isn't in the party. Rededge should accompany Narlen during his thief quests. Scar should appear outside the FF Barracks even if you don't speak to him on the bridge. Strings that are not yet translated into other languages should show untranslated English text, not "placeholder"
The item Gong Mallet should have a more accurate ground item. Trap spells should go off instantly when they are approached. Yeslick should not start dialogue with you after he leaves the party due to Dorn joining. You should be able to tell Safana that you already cleared the cave when you first meet her. [Bridgefort] The fire elemental that was supposed to trigger the explosive barrels instead attacked me, but the barrels still blew up. [Cyric temple] Some monsters spawned when I rested in the Cyric Temple, but they spawned inside of some cages. [iOS Options UI] Changes to Description should show when highlighting a new option within a scrollable option's area. [iOS][Options UI] Options->Sound should not Open "Movies" and "Movies" should have an effect. [Long Tap to Save Feature - iOS] Long Tap to Save in Standalone SOD Build should not be using .bg1save extension. [Options UI] Options->Credits->Done should take you back to the Options menu, not to the game menu. [PC] - Game should not crash when fighting multiple enemies in Dragonspear castle. [Retail Build, Standalone Build] Game should not crash upon importing a saved game. [SDD223c] Journal Entry 50750 should not be empty when Khalid refuses to pay you for the Aquamarine. [Story Mode] Story Mode should apply to NPCs as well as CHARNAME. Damage breakdown should be correct when equipping "Legacy of the Masters"
Plot should not move forward after getting permission from Ogres to Ascend to DSC Basement. Subtitle text for intro movies should not be right aligned. When can we expect to see the update at the Mac App Store? Hello! Very soon! We're working on it right now. This patch has rendered my game un-playable! My main character (and Dorn for some reason) cannot move properly. You tell them to go someplace and it takes them forever to get there! My main character does a stop go stop go stop go kind of chicken dance, and Dorn just stops moving completely. WTF Beamdog?!?!?!?!? Also, the in game mouse cursor keeps blinking at the same rate as my main character's chicken dance! Could you check out and read through this thread - https://forums.beamdog.com/discussion/comment/976294/#Comment_976294 - and try the offered solution? 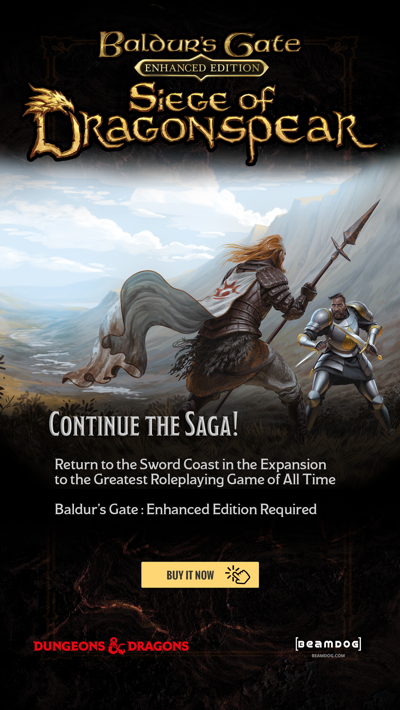 If you are unfamiliar with the console, read this thread - https://forums.beamdog.com/discussion/61900/how-to-enable-the-console-in-bgee-sod-bg2ee-in-version-2-0-and-later - first. i can't believe the amount of work an love you're putting in this game, thank you very much for giving us (the new generation) the oportunity to enjoy this masterpiece THANK YOU VERY MUCH! You really should hide some of those fixes behind spoiler tags. Thanks a lot guys for such a wonderful work! Amazing, wonderful great! May I ask just one more thing - let us personalize our character SPRITES! Please let us have a pure mage that is wrapped in leather bands or a fighter in a robe! Then I'd play a couple more thousand hours! This is a huge patch. Thanks for supporting the game like this. However, I don't see anything about TIS v1 format images. There are some mods out there that use these images, and the EE engine has bugs dealing with them. I know bug reports have been opened for this in the past. Has this been fixed in 2.5? Will it ever be addressed? I can't find a bug report for it, so please create one at support.baldursgate.com ! Thanks in advance! Does this mean multiplayer across devices will finally work? Issue "Map markers are broken." still not fixed as promised. There is not even a single mention of this bug in the changelog. thank you for your great effort and your hard work! We D&D nerds all appreciate it! I have a question considering Planescape: Torment. Are you guys still working on this game? Will it recieve a big update like the rest of your games, or is the 3.1.4 the final version? It seems that on Steam beta channel, you still get the old 2.5.15 version. You have to opt out of the beta to get 2.5.17. Maybe update the beta channel as well? This applies to both BG1 and BG2. Hi, this update was done on my mac 30 days ago and has created a bug which means Dorn in my party stops randomly when walking to where i click so i have to click 10+ times just to get him to move across a town etc. also when i pause the game it now becomes black and white which it never used to do. Hello! Thanks for your feedback. We're working on this issue. I finally bought and started playing the Steam version for Windows 10. Definitely lots of cosmetic changes, and I love how you can zoom in and out of the main game screens. Great changes to the Journal system. Glad you can stack more than 20 arrows/bolts and 5 potions etc. Still playing through from the Original Saga so keen to see what else is different. 3. There's no sandtimer thing in the bottom left corner to click to pause/unpause the game (as far as I could find) - you must do a keyboard button press. How do I verify that my copy has this update? The game crashes every time I complete the tier 1 round 3 battle in the black pits. Hello! Please zip and attach your save at support.baldursgate.com , and we'll help you. How can I updates my dvd games?? I bought the dvd times ago and now i wanna play with them in my pc.